I have got a bit more Fall decorating to share I hope you don’t mind. After having finished my Living Room Fall decorations and making some new Fall Pillows, I decided it was time I’d take myself outside and cozy up that corner with the white shelves. This is how I looked all through summer. Or more precisely how it looked after we finished painting our porch and we hung that shelf back up. This is actually how my Love decorated it. I had done a summer version of it. Took me a long time and I wasn’t exactly very happy with it – probably why I didn’t take any pictures. When we were putting things back after the painting project was done, my Love didn’t think twice about it and just plunked some of the decorations back on there he thought were there previously. He hadn’t thought about it! He wasn’t following any ‘rules’. He just did and followed his instinct! I always struggle with these shelves. I really like them, especially now that they are all white against that Greige wall. But I find them so hard to decorate. Maybe it is because you look up to them. Maybe because they are so narrow. I don’t know but I always struggle to get a good look. Of course that’s why it usually takes me until the season is almost over to change them up a bit, or I don’t change them at all (yeah that has happened, that I had berries wreaths hanging there all through summer. I just hung something here…. Filled up a lantern with Fall bounty…. Left a lot of empty space…. I still think My Love does a better job at this than I do, but he doesn’t really gave a hoot about this shelf. So this will have to do. And that’s just fine. It is Fall, it is nice, it is me. So do you recognize how sometimes to Get Things Done! You have to let your hands do the thinking instead of your head ?!? I’d ♥ it if you share your thoughts on this in the comments…. I am writing a series of 31 days to Get it Done! You can find all the posts in this series here. On the first day I explained in detail what this series is about and what I am going to do, find that post and all the post since then in order here. The shelves look good to me. Thanks for sharing. Have a great day. I am really enjoying your 31 day approach of getting it done! I love the simplicity of your Autumn decor. Wat een mooi plekje is dat geworden! En zo leuk dat je er zo op kijkt…Weer een schot in de roos!!! Gorgeous!! I over-think too. I'm trying hard to break my symmetry habit! I love seeing things just placed like you did. Simple is often best. 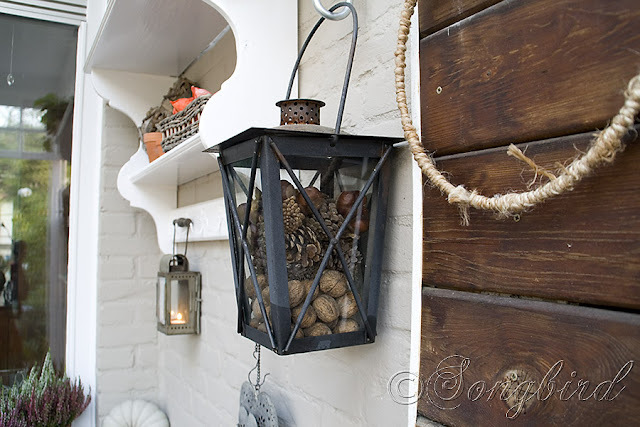 Love the lantern filled with autumn goodness. I think it's lovely! But I so know what you mean. I feel like I'm just not good at arranging shelves. You're right, just throwing some things up there is generally the best way to do it. I find scouring catalogues like IKEA or Pottery Barn and deco mags help inspire me to think outside the box, though. My biggest issue is having everything symetrical…ugh. And doing things in odd numbers. I know it looks better, but I still struggle with getting balance without having symetry!